Mmmm, I love that you stuffed it with lemon, too! The thai peppers must add such a vibrant flavor accent. Looks to die for! I absolutely love this story! And skin or no skin, this fish looks GORGEOUS! I watched the julia Child video and that part made me laugh so hard! Such a cute lady! Julia Child moments are what makes life fun, and cooking an adventure! Way to go for tackling such an intimidating dish! Perfect fix up job, I still think it looks good. I need to make fish this week, might tackle this one. Karen I didn't know you were in the Bay Area, me too. Small blog-o-sphere huh. Hope the rest of the week goes better. This was a great post. Its nice to know that other people don't always have picture-perfect results, either! This is very timely for me: yesterday I made a cabbage soup for dinner, but I used red cabbage because that's what I had and it needed to get used. Unsurprisingly, the finished soup was purple and slightly unappetising-looking! It tasted good though! Oh, I had my misfortunes in cooking more times than I care to count but I guess this comes with the territory. And I totally agree regarding the photos and editing and posting about a recipe, a lot of work indeed. But I think that this fish definitely was worth every minute you spent making it and posting about it! Looks delicious! Wow! This post made me so hungry. Delish fish is always a welcome treat for us! My mom always says your stomach doesn't know what it looks like! As long as it's yummy, it doesn't have to be beautiful. I've had a few recipes like that on my blog...not supermodel pretty, but so yummy! I think we all can relate...like the time I baked something and ended up with batter in my hair and the kitchen :lol:! I can't believe you don't think this is pretty-it is gorgeous!! This sounds wonderful, thank you for sharing! This looks like an incredible fish dish..so fresh. As for making mistakes in the kitchen, it happens to it all. It can be so annoying though!! yum! A light variation without the lemon, i add shredded ginger and soya sauce, dash of shaoxing rice wine and spring onions to the mix and steam it for 8-12 minutes (depending on fish size). one tip my mother gave me is that seafood always continue to cook after you've taken it out of the oven/pan/steamer, so always take note not to overcook it! Hey, I always tell my kids that it doesn't matter what it LOOKS like as long as it tastes good! Same goes for your fish! Try putting aluminum foil down on the grill that you rub with olive oil. Poke holes in it with a fork to let the smokey flavor come up! Although you may not think so, I think this looks gorgeous! I dunno what you're thinking about but I think that fish looks fabulous! So yummy, I can just picture it! Buzzed! Yeah, Julia Child is my hero. The fish looks beautiful. We are always are own worst critics. I don't know...it looks great to me. I know what you mean, though. I've experienced making something and it coming out blog worthy but when I actually intend to share it, something goes wrong. Oh, well. Glad you shared this one. Sometimes we just have to roll with the punches. And it ended up tasting great, so all is well in my book =) Looks great Karen! Sorry it didn't come out the way you wanted, but it still looks tasty. Fish can be tricky on the grill. 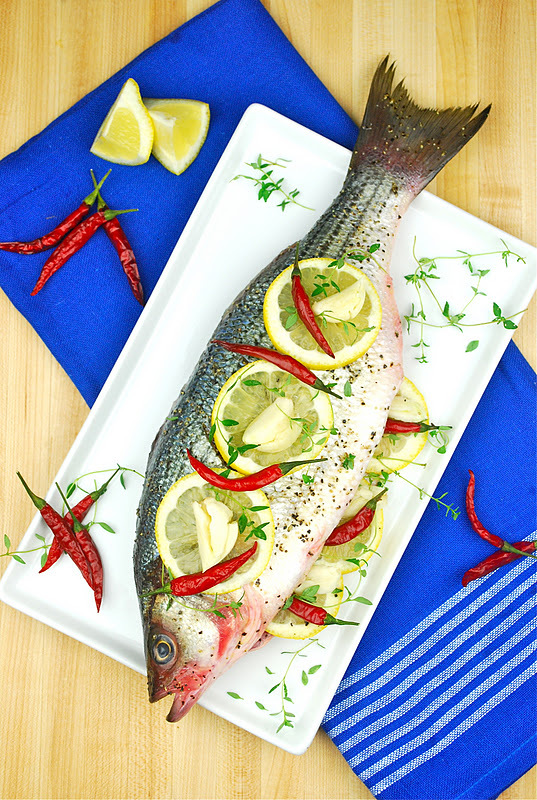 Have you tried to make a "bed" of lemon slices on the grill to lay the fish on? That way its not in direct contact with the grates and you won't lose the skin. I think it look amazing, many of my post never happen but only becasue we eat it all before I can even think about taking pics, lol.. thanks for pushing ahead to share this great recipe with us!! You made a good work making that fish look pretty! Yum, this looks so delicious! I love all the lemon you used, to me it's the best ingredient for seafood!